The protagonist is the main character of a story, and the main playable character in the Grand Theft Auto games. The protagonists between Grand Theft Auto III and Grand Theft Auto IV share similar qualities. Most protagonists are new to town, either returning after a long time gone (such as Carl Johnson and Toni Cipriani) or have never been to the city before (such as Claude, Tommy Vercetti, Victor Vance and Niko Bellic). The protagonists usually start with nothing, with minimal influence and reputation, having to do odd jobs around for various small-timers, gaining friends and allies (like Asuka Kasen, Avery Carrington, Wu Zi Mu, and Little Jacob) before moving up the social and economical ladder, attempting to rise through the criminal underworld, although their motives for doing so vary in each game. They eventually start establishing a name for themselves in the town, doing real jobs, making bigger and more powerful friends and business partners, and cutting real deals as their prominence, respect, money, and reputation begins to grow, until they end the game on top of the city, or at least with some powerful business and/or friends. Abnormal protagonists would be Luis Fernando Lopez and Johnny Klebitz who have always lived in Liberty City or Alderney and have already established their name, powerful friends, and high social and economical standing at the start of the game and must defend it from competitors. Most protagonists have a consistent distaste of drugs, and while deal and work with them, never use them. The protagonists of Grand Theft Auto V also have lived in Los Santos and Blaine County for at least a little while before the game begins. However the GTA Online Protagonist is new to Los Santos. The main antagonists of the Grand Theft Auto games are usually introduced very early in the story, usually as the protagonist's friend or acquaintance until a major, personal betrayal (like Catalina, Sonny Forelli, Frank Tenpenny, Jerry Martinez and Dimitri Rascalov) and are usually seen, heard, or mentioned throughout the game, moving against the protagonists' plans or goals, until they are finally confronted in some large-scale showdown by the protagonist at the end of the game. An abnormal antagonist is Massimo Torini; he makes less appearances than all the other antagonists in the other games (only 2). Group reason: While Claude does maintain a close friendship and working relationship with the Yakuza over the course of the game, he always acts freelance and never makes a commitment to any gang. Group reason: Formerly an associate of the Forelli Family, Tommy founded the Vercetti gang after taking over Ricardo Diaz's empire in Vice City. The actual name "Vercetti Gang" spawned when Tommy bought Kaufman Cabs and Doris tells the employees that the "Vercetti Gang" owns it now. She came up with it as an impromptu excuse because the firm apparently has been owned in the past by other gangs & that's all the firm knows (possibly the Mafia or Cartel, as named by Delores) then the name sticks. Group reason: CJ's brother, Sweet was a leader of the gang and therefore makes CJ the underboss. CJ has friendly relationships with the Triad leader Wu Zi Mu, and Varrios Los Aztecas leader Cesar Vialpando. Group reason: Mike, like Claude, also maintains close friendships with some gangs yet has never made a commitment to one. He is first seen working for the Mafia, yet is allied with Cisco, the leader of the Columbian Cartel. Group reason: Toni's parents possibly were in the Leone Family (as hinted by his mother in Grand Theft Auto: Liberty City Stories), but it is never given how he joined the family. He is close friends with Don Salvatore Leone and is made Caporegime later in the game and keeps his position well into GTA III. Group reason: Johnny is the Vice President of The Lost biker gang, and is a full on member as well. He also is/was best friends with Billy Grey, the President of The Lost, until the latter was imprisoned and the presidential torch passed to Johnny. Group reason: Luis works for Anthony Prince, who isn't a part of any specific organization. He is also friends with the Northwood Dominican Drug Dealers' members Armando Torres and Henrique Bardas, and depending on the player, can spend time building up their drug empire. Group reason: Huang's father was head of the gang before he was killed for the Yu Jian Sword. Group reason: Michael is not attached to any group, and instead cycles through different crew members for heists. Group reason: Franklin grew up on Forum Drive and was born into the Chamberlain Gangster Families. Group reason: Trevor operates his own methamphetamine manufacturing ring in Sandy Shores with Ron Jakowski, Wade Hebert, and Chef. Additionally, Trevor is also allied with Oscar Guzman in weapons trafficking. Group reason: New to the city, the GTA Online Protagonist can either work freelance or as a part of a player-created crew to complete jobs for various criminal individuals and organizations. Group reason: Owned by Lamar Davis and currently in the care of Franklin Clinton. The following are missions and cutscenes in the Grand Theft Auto series where different protagonists appear in the same cutscene or interact with each other directly. This lists excludes the interactions between the three protagonists of Grand Theft Auto V.
Tommy Vercetti, the protagonist of Grand Theft Auto: Vice City. Carl "CJ" Johnson, the protagonist of Grand Theft Auto: San Andreas. Mike, the protagonist of Grand Theft Auto: Advance. Toni Cipriani, the protagonist of Grand Theft Auto: Liberty City Stories. Victor "Vic" Vance, the protagonist of Grand Theft Auto: Vice City Stories. Johnny Klebitz, the protagonist of The Lost and Damned. Luis Fernando Lopez, the protagonist of The Ballad of Gay Tony. Huang Lee, the protagonist of Grand Theft Auto: Chinatown Wars. Michael De Santa, a protagonist of Grand Theft Auto V.
Trevor Philips, a protagonist of Grand Theft Auto V.
Franklin Clinton, a protagonist of Grand Theft Auto V.
Chop, the protagonist of Chop the Dog. Franklin Clinton, Trevor Philips and Michael De Santa together. The four GTA IV Era protagonists (Niko, Johnny, Luis and Huang) have criminal records in the LCPD Database, and each have the crime "Grand Theft Auto" listed. Carl Johnson, Toni Cipriani, Johnny Klebitz, Luis Fernando Lopez, and Franklin Clinton are the only characters born and raised in the location of their respective games. The following protagonists begin the game either new to the specific location, or has returned after a long time away, usually relative to the player. Tommy Vercetti is tasked by the Forelli Family in Liberty City to set up business in Vice City. Toni Cipriani is returning to Liberty City from an unspecified location after a four year absence similar to the player (1994 to 1998). Michael moves from Ludendorff in 2004 and eventually ends up in Los Santos before 2013. Trevor Philips moved across the country for many years before settling in Blaine County. Eventually Trevor also travels to Los Santos for the first time in search for Michael. Claude, Mike, Niko Bellic, Michael De Santa and the GTA Online Protagonist are so far the only protagonists of any GTA game to work freelance (not a member of any particular organization). However at some points Luis Lopez, (after leaving North Dominican Drug Dealers) and Vic Vance (before starting the Vance Crime Family) worked freelance as well. The online player can choose to start their own crew or work as part of an existing crew. Every GTA IV Era protagonist has long sleeved shirts/suits/jackets and cannot have a short sleeved shirts mostly because of the season the game takes place in. 2D Protagonists, Mike, Johnny Klebitz, and Huang Lee were the only protagonists to not change their clothes in the entire game. Claude starts GTA III in a prison jumpsuit, but otherwise does not change clothes throughout the game. In the original Grand Theft Auto, GTA: London 1969, GTA: London 1961, and GTA Online, the player can choose the protagonist, and GTA 1 and GTA O are the only games in the series to feature the possibility of female protagonists. Tommy Vercetti, Victor Vance, Trevor Philips and the GTA Online protagonist are the only protagonists to lead their own criminal gang. Tommy founded the Vercetti Gang, Victor and Lance founded the Vance Crime Family, Trevor founded TP Industries, and any player online can create and be the leader of their own online crew. Carl Johnson, Toni Cipriani and Johnny Klebitz are the only protagonists to be second in command of a criminal gang. CJ is second in command of the Grove Street Families, Toni gets promoted to caporegime during the events of GTA Liberty City Stories, eventually becoming Salvatore Leone's right hand man, and Johnny was the Vice President of the Alderney Chapter of the Lost MC; however, Johnny later became chapter President after Billy Grey was incarcerated. Victor Vance and Johnny Klebitz are the only known protagonists to be killed without a determinant status. Carl Johnson, Johnny Klebitz, Michael De Santa, Franklin Clinton, and Trevor Philips are the only protagonists known to smoke marijuana during their game. Johnny Klebitz and Trevor Philips are the only protagonists to use heavy drugs during any Grand Theft Auto game. 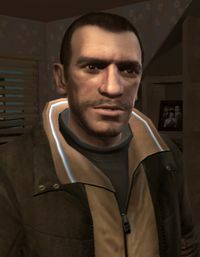 Victor Vance, Niko Bellic, and Trevor Philips are the only protagonists known to serve in any form of military, with Vic serving in the U.S. Army, Niko serving in the Bosnian Wars, and Trevor in the Air Force; however it is unspecified if he served in the U.S. Air Force or the Royal Canadian Air Force. Vic was discharged for breaking base conduct rules, Trevor was discharged after being deemed mentally unfit for service, while Niko's discharge status is unknown. Luis Lopez is the only GTA IV Era protagonist that doesn't work with another protagonist. (excluding the non-canon GTA Chinatown Wars) Niko and Johnny work together in two missions. Luis Lopez is the only protagonist whose middle name is revealed. Claude and Mike are the only protagonists with no known family members. Excluding Angus Martin whose whereabouts are unknown, all of the main members of the Alderney Chapter of The Lost Brotherhood were all murdered by protagonists. Jason Michaels and Jim Fitzgerald were murdered by Niko, Brian Jeremy and Billy Grey were murdered by Johnny, and Terry Thorpe, Clay Simons and Johnny Klebitz himself are killed by Trevor. Ashley Butler can also be killed by Trevor.